After a fun-filled Thanksgiving week in Florida with my parents, yesterday we returned home to Philly to the cold weather. 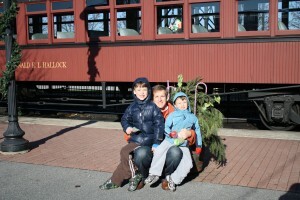 Luckily for us, today we had a great day planned out to ride the Santa Express on the Strasburg Railroad in Lancaster County, PA.
We meet up with my good friend Colleen of Classy Mommy and her family and the kids had a blast. 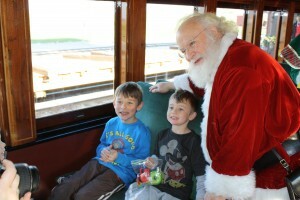 Santa visited our train and Christmas carolers walked the train and got everyone in the Christmas spirit. I wanted to share some fun photos from the day! We also took a quick visit over to Choo Choo Barn after we were done. My kids loved seeing all of the miniature trains and towns in the room-sized model train display – their favorite display was the house that catches on fire and has to be put out by the local firemen. Lots of un! 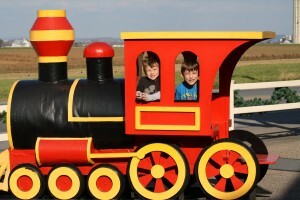 If you live in the area or are ever planning a trip to Lancaster County, check out these websites for more information: Strasburg Railroad and Choo Choo Barn.